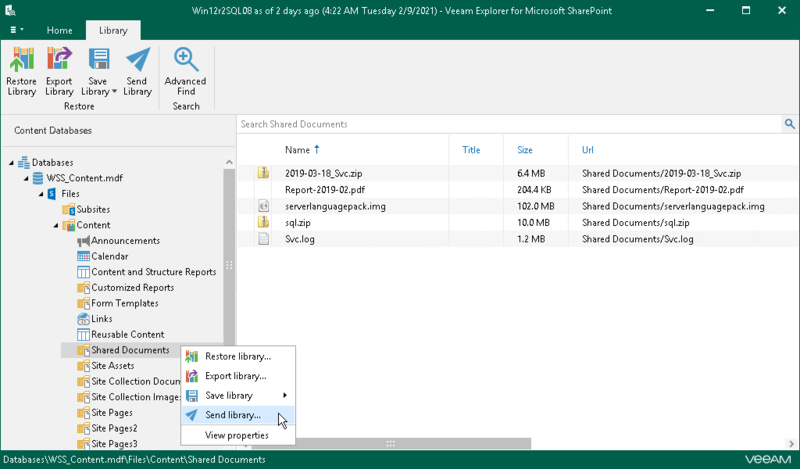 Veeam Explorer for Microsoft SharePoint allows you to send libraries or library documents to the specified recipients via email. Before sending documents, make sure to configure SMTP settings, as described in Configuring SMTP Settings. The amount of data you can send at a time depends on your SMTP server configuration. In the navigation pane, select a library to send. On the Library tab, select Send Library or right-click an object and select Send Library. To send documents from a library, select a document in the preview pane and click Send Document. The From field is filled automatically based on the address you have provided when configuring SMTP settings. To edit the message body, click More Details.